The 2017 minor league regular season is in the rear-view mirror. There were some great performances on the Astros farm this season. Let’s take a look at the Astros post season minor league All-Star team. The Astros acquired Stassi in the first trade that sent Lowrie to Oakland. He had a breakout 2013 season and has received some time with Housotn but failed to regain his stroke. He turned it around in 2017 though hitting .272 with a .500 SLG and a 126 wRC+ in AAA. It’s nice to see Stassi show off the power again. He has also hit well with Houston in limited time and could be one of the catcher next season. Alvarez was originally signed by the Dodgers out of Cuba for $2 million and the Astros snagged him in the trade that sent Fields to Los Angeles. Alvarez was seen as a raw prospect coming into this year but he turned heads crushing the ball in Quad Cities with a 207 wRC+ in 32 games. He was promoted to Buies Creek and was solid there as well cutting down on his strikeout rate. He played some in the outfield but should start moving up the ranks as a first base prospect. Kemp has hit well at every level and though he was repeating AAA, he made it look easy. He finished hitting .329 with just 43 SO in 118 games. He also set a new career high in triples, homeruns, and SLG for his minor league career. He has also shown steady improvement in each year in AAA. He seems ready to get a legitimate shot with some MLB club. Davis has shown power throughout his career and it continued in 2017. He started the season back in AA showing improvement before being promoted to AAA. In 16 games with Fresno he hit 5 HR and drove in 18 earning him a callup to the Astros. Davis has posted a 125 wRC+ in 18 MLB games. Moran was very good as well but played less than Davis due to the call-up and subsequent injury. After having Carlos Correa and Alex Bregman go through the system it just seemed inevitable the Astros would have another stud performer at shortstop. That wasn’t the case this year. Brignac was a solid veteran bat in AAA but outside of him, there wasn’t much else. The Astros never needed to call him up but he provided the insurance just in case the Astros had multiple injuries on the infield. Fisher started the 2017 season in AAA and showed his worth early on. He hit .292 in April and .369 with 8 HR, 24 RBI in 27 games in May. Fisher finished his AAA season hitting .318 with 21 HR and a 147 wRC+ earning a call-up to Houston where he has contributed in the outfield. Tucker started the season with Buies Creek and hit .288 with 9 HR, 43 RBI in 48 games. He was promoted to Double-A and hit another 16 HR in 72 games totaling 25 HR on the season. He did all of this at just 20 years old. Overall he had a .874 OPS and a 141 wRC+ in 2017 and saw his stock rise up to one of the best outfield prospects in baseball. Martin was drafted by the Astros in the 8th round of the 2013 draft. Martin built on his 2016 season and made his way to AA in 2017. He started the season in Buies Creek and hit .287 with 7 HR in 46 games. With Corpus he hit .273 with 24 2B, 11 HR in 79 games. He lead all Astros minor league hitters in doubles with 35 overall. Signed by the Astros out of Cuba, Armenteros had another great season. Armenteros established himself as a legit prospect last season and was even better in 2017. Armenteros pitched in 14 games for Corpus and had a 1.93 ERA with 74 K in 65.1 innings. He was promoted to AAA and was great going 8-1 in 10 starts with a 2.16 ERA and 72 K in 58.1 innings. We should see him in Houston next season. 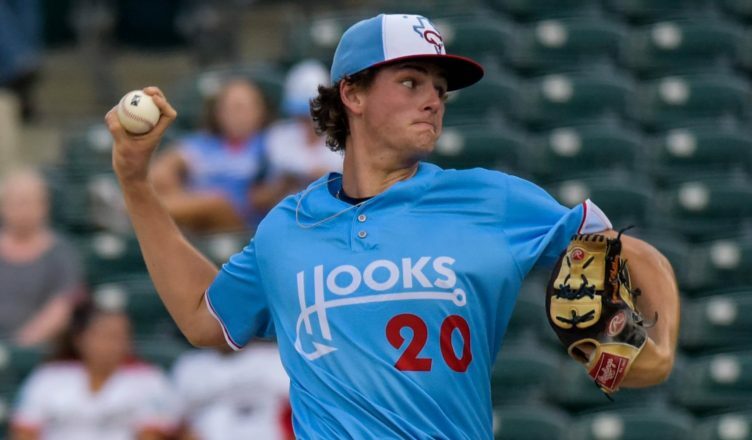 Whitley was the Astros first round pick in 2016 and he has rocketed through the Astros system. Whitley started the season with Quad Cities and had 67 K in 46.1 innings with a 2.91 ERA. He was promoted to High-A Buies Creek where he had a 3.16 ERA and 50 K in 31.1 IP. He finished with Corpus Christi posting a 1.84 ERA over 4 outings with 4 BB/26 K in 14.2 innings. Whitley has established himself as one of the best pitching prospects in baseball. LaRue was the Astros 14th round selection in 2016. This season he was one of the more dominating pitchers for Quad Cities going 12-4 with a 2.86 ERA and allowing just 76 hits in 100.2 innings. He was promoted to Buies Creek and pitched in 4 games to close out the season. Overall, he had a 3.23 ERA in 120 IP. Javier is just 20 years old but really had a solid 2017 season. He only pitched in 4 games with Tri-City striking out 24 in 16.2 innings with a 2.70 ERA before moving to Quad Cities. He really stood out for the River Bandits posting a 2.39 ERA with 47 K in 37.2 innings. He has also been a big time performed so far in their playoff run. Quiala is another under the radar Cuban signing by the Astros. He started the season with Buies Creek and went 5-1 with a 2.31 ERA and 59 K in 58.1 innings. He was promoted to AA and had a 2.86 ERA in 50.1 innings. Overall he had a 2.57 ERA with 92 K in 108.2 innings. Stutzman was signed as an undrafted free agent and really had a good year. The lefty pitched across three different levels (A+, AA, AAA) and had success at every level striking out 72 in 67 innings. Hill pitched solely in relief this year and found his spot. Pitching across three levels he had a 1.95 ERA allowing just 43 hits in 64.2 innings while striking out 68. Another year, another solid season for Dorris. Though he doesn’t through hard, he has continued to rack up the strikeouts and did so in AA and AAA this year. Hernandez was drafted out of the University of Houston and was dominant to start the season for Buies Creek striking out 48 in 34 innings. He was promoted to AA and struggled a little bit but still had a solid season overall.